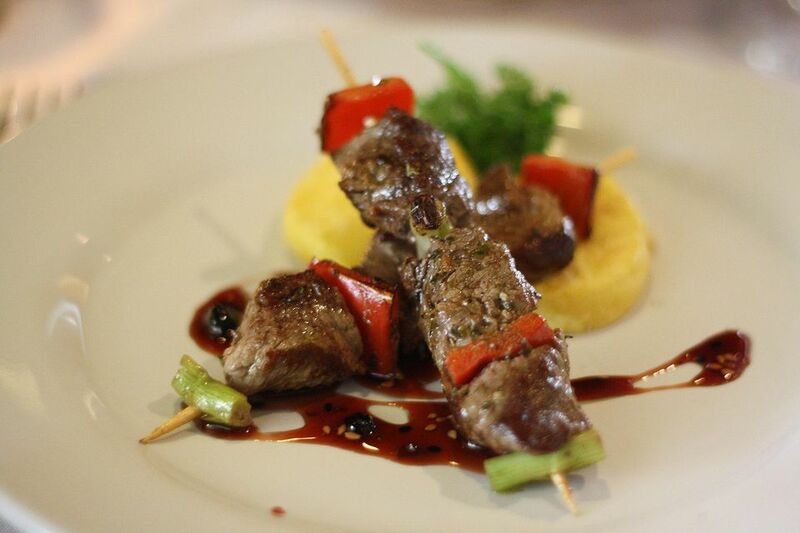 This is a Peruvian recipe for grilled beef skewers. You start by preparing a marinade that is loaded with delicious flavor. Then you thread these steak pieces onto skewers and grill them hot and fast. Serve over rice or grilled vegetables. Place jalapenos and garlic in a blender or food processor. Grind to a pulp. Add remaining ingredients, marinade ingredients and continue blending. Cut steak into 1 inch cuts and place in large bowl. Pour 2/3 of blended mixture over meat and cover. Let marinate for 3-4 hours. Place remaining 1/3 of marinade in a air tight container and store in the refrigerator until ready to use. Preheat grill. Remove reserved marinade from refrigerator and let stand at room temperature. Thread meat onto skewers and place onto grill grill. Baste occasionally with remaining marinade. Grill skewers for 10-15 minutes, turning every so often. Once meat is cooked, remove from heat and serve. You may also add sliced bell peppers to these skewers if you wish.